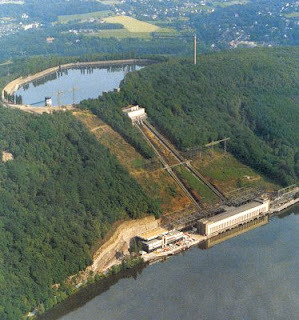 Pumped storage hydroelectric power generation is used by some power plants for load balancing. The method stores energy in the form of water, pumped from a lower elevation reservoir to a higher elevation. Low-cost off-peak electric power is used to run the pumps. During periods of high electrical demand, the stored water is released through turbines. Although the losses of the pumping process makes the plant a net consumer of energy overall, the system increases revenue by selling more electricity during periods of peak demand, when electricity prices are highest. Pumped storage is the largest-capacity form of grid energy storage now available. In the 1930s reversible hydroelectric turbines became available. These turbines could operate as both turbine-generators and in reverse as electric motor driven pumps. The latest in large-scale engineering technology are variable speed machines for greater efficiency. These machines generate in synchronization with the network frequency, but operate asynchronously, independent of the network frequency as motor-pumps. During a 30-year period from the late 1950s to the late 1980s, approximately 19,500 MW of pumped hydroelectric storage facilities were brought into service in the United States. By 2000 the United States had 19.5 GW of pumped storage generating capacity, accounting for 2.5% of base load generating capacity. PHS generated (net) -5500 GWh of energy because more energy is consumed in pumping than is generated; losses occur due to water evaporation, electric turbine/pump efficiency, and friction. Conventional Hydroelectric Plants do not use pumped-storage, but those that have significant storage capacity may be able to play a similar role in the electrical grid as pumped storage, by deferring output until needed. Hold Back Hydro - The need for expensive peaker power plants could be reduced, simply by holding back hydro reserves (water) for times when the most expensive peaker operation is now required. As renewables develop this could go further to act similarly to store power, not by actually pumping, but simply by gating off the water flow when renewable power was surging. This has the same effect as storage, since there is water held in reserve just as if it had been pumped there. Full capability would involve some addition of holding ponds to manage water flow appropriately. Spain seems to do this to some degree, meaning they completely shut off hydro output at night, thus having capacity to respond at peak times. It is not clear to what extent they utilize the rapid response possibilities. Linking windpower and hydropower can add to the nation’s supply of electrical energy. Large wind machines can be tied to existing hydroelectric power plants. Wind power can be used, when the wind is blowing, to reduce demands on hydropower. That would allow dams to save their water for later release to generate power in peak periods. Very Dispatchable – Hydroelectric generating units are able to start up quickly and make rapid adjustments in output. They operate efficiently when used for one hour or several hours. Thermal plants are much less able to respond to sudden changes in electrical demand, potentially causing frequency and voltage instability. Pumped storage plants can respond to load changes within seconds. Relatively Efficient - Approximately 70% to 85% of the electrical energy used to pump the water into the elevated reservoir can be regained. The technique is currently the most cost-effective means of storing large amounts of electrical energy on an operating basis. Supports Reliability - load following, and frequency control helps protect against system failures that could lead to the damage of equipment and even brown or blackouts. Improved Response Time - The variable pump/turbines made today for pumped hydro can address numerous ancillary service needs; not only are they much more versatile when coupled with state of the art stators and electronics they being response times down to where a 15 minute two way market is possible. They are just now starting to replace the older models in some of the PHS facilities in the US in response to market demands for something other than peak energy. Low Energy Density - Pumped storage systems requires either a very large body of water or a large variation in height. For example, 1000 kilograms of water (1 cubic meter) at the top of a 100 meter tower has a potential energy of about 0.272 kWh. The only way to store a significant amount of energy is by having a large body of water located on a hill relatively near, but as high as possible above, a second body of water. In some places this occurs naturally, in others one or both bodies of water have been man-made. Geographic Limitations - make it difficult to be placed where needed most needed. Because of the need for significant elevation changes in pumped hydroelectric plan designs, the number of environmentally acceptable sites for future pumped hydroelectric facilities is very limited. The siting of new plants will face the same objections that the siting of new transmission lines faces today. Evaporation - Losses from the exposed water surface. Ecological Damage from fluctuating water levels. In the Pacific Northwest for example, incorporating wind power raises environmental issues as the BPA tries to balance mandates from states for more renewable energy against a responsibility to protect migrating salmon. The Northwest’s wind turbine farms are geographically concentrated at the east end of the Columbia River Gorge. While the BPA has a concentration of transmission lines in that corridor to serve dams, the lines are already overtaxed. And when the wind blows, all of the wind farms start sending power to the grid at the same time. The federal hydro system is a great tool to integrate with wind because reservoirs are the only large-scale way to store energy and can quickly ramp up and down to balance intermittent supply and demand. However, the system has its limits, and when wind speeds jump or fall well beyond the levels forecast by wind farm operators, it can require the agency to operate with inadequate reserves or spill water in a way that is harmful to fish. Transmission Congestion - These plants are generally located some distance from load centers and can do little to effect potential congestion issues that impact utility transmission and distribution networks during periods of peak demand. North American Hydro - Schofield, WI- Specializes in developing, upgrading, owning, and operating hydroelectric facilities. Unlike other companies, retaining assets in approximately 40 hydroelectric facilities allows us to offer integrated solutions that are backed by direct operations and maintenance experience. Hydroelectric Power" (PDF). United States Bureau of Reclamation. East China Electric Power's Tianhuangping pumped storage hydroelectric project is the biggest of its type in Asia. Might you want an "uprated hydro" description/link on this page? Very excellent site you've got here. Very valuable resource for someone like me whose education was in a different field.